Falvey Memorial Library :: April fish! 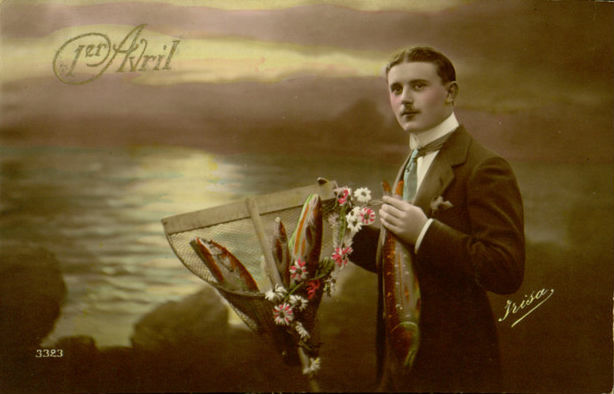 A late-19th-century “April fish” postcard. There are many theories about the origins of April Fool’s Day celebrations. One such theory is that it originated in France in the 16th century when King Charles IX adopted the Gregorian calendar, moving the start of the year from the end of March to January 1. Legend has it that the people who continued to celebrate the New Year on April 1 were mocked and had pranks played on them. Despite its popularity, this is a questionable theory, as Alex Boese, curator of the Museum of Hoaxes, points out. The calendar reform was not a sudden change but rather a gradual process throughout the 16th century. In addition, the French New Year prior to the reform was officially celebrated on Easter, which is a holiday based on the lunar calendar and thus has no official relationship to April 1. Another French origin story for April Fool’s Day points out the large numbers of newly-hatched fish that populated the rivers in April. These young fish were easy to catch and thus became known as “poisson d’Avril” or “April fish.” Celebrating the arrival of these easy-to-catch fish led to people playing pranks on each other and the still-practiced French custom of trying to tape a paper fish to someone’s back and dubbing them a “poisson d’Avril.” The postcard above is an example of poisson d’Avril greetings that were especially popular in the late-19th- and early-20th-centuries. Regardless of the actual origins of April Fool’s celebrations, be on your guard today and beware the poisson d’Avril! And don’t miss the Museum of Hoaxes’ April Fool Archive!